We donate a portion of the proceeds of every class we sell to ProStart. ​With national and local support from industry members, educators, the National Restaurant Association Educational Foundation (NRAEF) and state restaurant association partners, ProStart™ reaches nearly 140,000 students in more than 1,800 high schools across 50 states, the Territory of Guam and at Department of Defense Education Activity schools in Europe and the Pacific. From culinary techniques to management skills, ProStart’s industry-driven curriculum provides real-life experience opportunities and builds practical skills and a foundation that will last a lifetime. Each year the winning Culinary and Management Teams from each state and territory are invited to the National ProStart™ Invitational (NPSI) competition where millions of scholarship dollars are up for grabs! This year's event was held in Charleston, SC. Check out ProStart's Twitter page here. Restaurant Class supports ProStart™ by serving as judges at the Tennessee State competition and mentoring TN teams advancing to the NPSI. Restaurant Class is a proud member of the Tennessee Hospitality & Tourism Association (TnHTA) which has its own Education Foundation (TnHTEF). Led by Austin Schneider who coordinates the ProStart™ program, it is open to high school students throughout Tennessee. The restaurant and hospitality industry in Tennessee is booming and the challenge to recruit and retain skilled and qualified culinary and management professionals is ongoing. ProStart™ seeks to set up for success the next generation of leaders in the food and hospitality industry. Check out TNHTA's Twitter page here. Lebanon HS Team Members: Lucas Oakley, Josh Crook, Corbin Hagman and Hailey Fields. 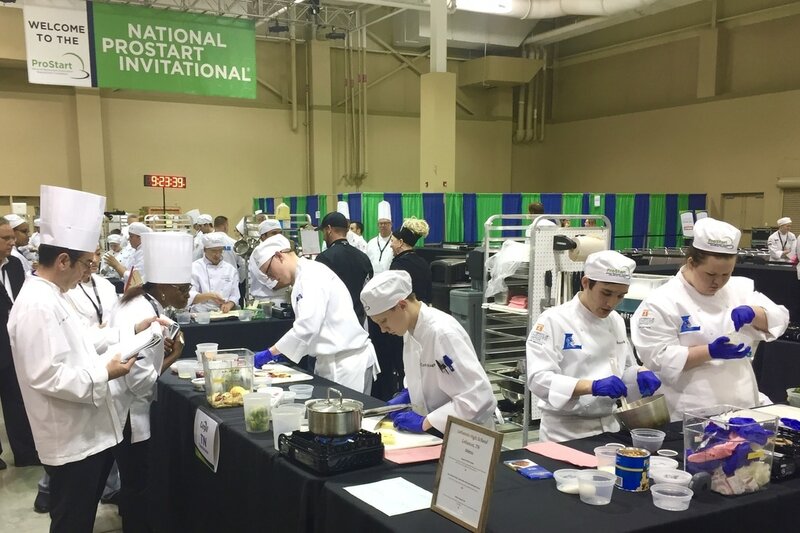 At the 2017 NPSI competition in Charleston, SC, members of the Lebanon High School Culinary Team prepared their menu items which consisted of a starter, an entree and a dessert. Their starter was a Dogwood Winter salad featuring romain and spring mix tossed in a pomegranate vinaigrette, topped with beets, goat cheese, jimica, apples, oranges and bacon. The main course was a pan-seared chicken cordon bleu with lemon raspberry sauce with parsnip potato mash and sautéed Brussels sprouts. The final course was a salted caramel tart with cashews, topped with a toasted meringue. Culinary teams are judged in six different areas: product check-in; knife skills; taste and finished product; safety and sanitation; team presentation and organization; and menu and recipe presentation. All phases are timed and evaluated by over 30 different judges from around the country so these young folks are learning real life skills of what it is like to perform at a high level while under intense pressure! Members of the Wilson Central High School Management Team presented their business proposal to judges on a regimented timed schedule. Prior to the 2017 NPSI competition in Charleston, SC teams were given a choice of the following concepts: a free-standing restaurant, a restaurant located in a strip mall, a restaurant located in an airport concourse or a mobile food truck. The team presented their business proposal for a vegan food truck concept called Refuel Snacks and Smoothies. Management teams were evaluated in six areas: concept; menu and costing; layout and staffing; marketing and critical thinking. In each area the team was interviewed by restaurant executives who were experts in their field and who thoroughly tested each member's command of subject matter, public speaking effectiveness and the ability to function under deadlines and pressure. Certainly life skills for any endeavor! Wilson Central HS Team Members: Kassidy Heimbach, Mikayla Mock and Tyler Lewis. If you would like to help Tennessee develop the next generation of food service leaders by donating or volunteering, or have any questions about the ProStart™ program, contact Austin Schneider at 615-385-9970 or austin@tnhta.net. The Tennessee Hospitality & Tourism Education Foundation is located at 475 Craighead Street, Nashville, TN 37204.